This story was updated at 10:25am May 15, 2011. Additional/ edited text in green type. Mystery still surrounds the deaths of six foreign tourists and a Thai national tourist guide who stayed at The Downtown Inn in Chiang Mai earlier this year, with Provincial Governor ML Panadda Disakul criticising foreign media for exaggerating news that the Dow Chemical Co. chlorpyrifos was found in the room of dead New Zealand woman Sarah Carter. Mr. Panadda also dismissed claims made by a New Zealand-based United Nations scientist, who told New Zealand’s 60 Minutes program last Sunday that in his opinion Ms. Carter had been “killed by an overzealous [insecticide] sprayer”, saying there is no medical proof. On the 60 Minutes report Dr. Mc Dowall said he had sent the results to other experts in New Zealand and Italy and all agreed it was chlorpyrifos poisoning. However, despite such a firm statement, Mr. Panadda said there was not enough medical information to support the claims that a bed bug killer containing chlorpyrifos was responsible for the deaths of tourists at The Downtown Inn in Chiang Mai. He said that tissue samples from the victims had been sent for testing at laboratories in the US and Japan and a team of doctors will announce the results of the tests, though no time-frame was given as to when that will be. However, on the 60 Minutes episode, Dr. Mc Dowel said that if chlorpyrifos is the cause of the deaths the blood and tissue samples will be of little help, because the “chemical only has a half-life in people of about a day”. When 60 Minutes visited The Downtown Inn it found the entire fifth floor undergoing extensive cleaning, with furniture and fittings extensively stripped and in-room air conditioners being flushed, allegedly one day ahead of an inspection by Chiang Mai Public Health officials. According to Dr. Mc Dowell, the fact the room had been scrubbed clean and that “significant levels” of the chemical remained three months later “is a huge concern”. In 2001, ahead of looming regulatory action by the US Environmental Protection Agency, Dow withdraw registration of chlorpyrifos for use in residences and places where children could be exposed, and also restricted its use on crops. About the same time the Australian Pesticides and Veterinary Medicines Authority (APVMA) restricted chlorpyrifos products used in the home and garden to low concentrations (not greater than 50g/L). The AVPMA also removed approval for the use of chlorpyrifos in indoor broadcast applications involving spraying surface areas such as floors and walls, strengthened environmental protection warnings and safety directions, and changed use patterns to remove undue risks to worker health and the environment. In its interim September 2000 report, the APVMA said chlorpyrifos possessed “a high potential chronic and moderate potential acute toxicity risk”. Although not classed as a restricted chemical product in Australia, where special training and/or other requirements are needed to be able to handle or use the chemical, the an APVMA spokesperson said the government agency has not registered any chlorpyrifos products for use in the control of bed bugs. The spokesperson also said the APVMA “is not aware of any deaths from the use of chlorpyrifos in Australia”. The deaths of the Chiang Mai seven are remarkably similar to the unexplained deaths on Koh Phi Ph of American tourist Jill St Onge and Norwegian holiday-maker Julie Michelle Bergheim at The Laleena Guesthouse on Koh Phi Ph on May 6, 2009, with Ms. St Onge’s fiance, Ryan Kells, reporting a strong smell of chemicals in the room they occupied. Despite what appears to be a reasonable and plausible explanation for the string of Chiang Mai tourist deaths, foreign governments and peak tourism industry bodies in Australia, New Zealand, the USA and the UK have refused to comment, or respond to questions as to whether they intend to advise nationals of their respective countries that the “banned in the USA” chemical, is used in Thailand. 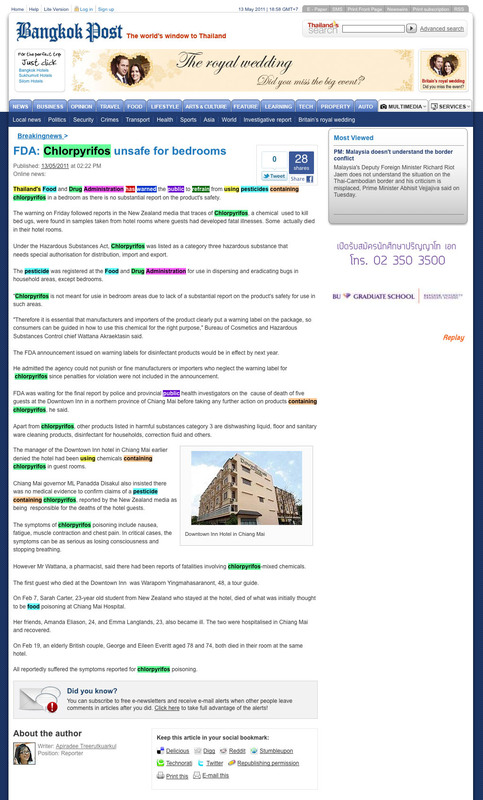 Approaches to the New Zealand Ministry of Foreign Affairs, The British Embassy in Bangkok, and the Norwegian Embassy in Bangkok went unanswered, while the Australian Department of Foreign Affairs issued a blanket statement advising travelers to subscribe to and/or check the Australian Government’s Smartraveller report for Thailand, “which reflects the Government’s understanding of the risks faced by Australians in Thailand at this time”. A spokesperson for the American Embassy in Bangkok said it was aware of the deaths and the ongoing investigation and offered its condolences to the families, noting that it “has offered the technical assistance of Centers for Disease Control and Prevention (CDC) personnel in Thailand to assist the Ministry of Public Health in its investigation”. Approaches to the British Association of Travel Agents, the Australian Association of Travel Agents, the US Travel Association and the Tourism Industry Association New Zealand as to whether they would advise their travel agents to make disclosure to intending tourists about the use of chlorpyrifos all went unanswered. Speculation that Thai authorities may not be being totally transparent in their reporting and handling of the situation received a boost when the country’s English-language newspaper, the Bangkok Post published an article on on its website on May 13 titled FDA: Chlorpyrifos unsafe for bedrooms*, and then without explanation removed it less than two hours later – though not fast enough to prevent a cached copy of the page being indexed on the internet. The original article stated: “Thailand’s Food and Drug Administration has warned the public to refrain from using pesticides containing chlorpyrifos in a bedroom as there is no substantial report on the product’s safety. 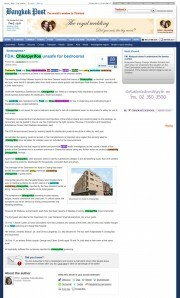 The recovered cached page that the Bangkok Post removed after less than two hours online. “The warning on Friday followed reports in the New Zealand media that traces of Chlorpyrifos, a chemical used to kill bed ugs (sic), were found in samples taken from hotel rooms where guests had developed fatal illnesses. Some actually died in their hotel rooms. “Under the Hazardous Substances Act, Chlorpyrifos was listed as a category three hazardous substance that needs special authorisation for distribution, import and export. “The pesticide was registered at the Food and Drug Administration for use in dispersing and eradicating bugs in household areas, except bedrooms. “”Chlorpyrifos is not meant for usie (sic) in bedroom areas due to lack of a substantial report on the product’s safety for use in such areas. “”Therefore it is essential that manufacturers and importers of the product clearly put a warning label on the package, so consumers can be guided in how to use this chemical for the right purpose,” Bureau of Cosmetics and Hazardous Substances Control chief Wattana Akraektasin said. “The FDA announcement issued on warning labels for disinfectant products would be in effect by next year. “He admitted the agency could not punish or fine manufacturers or importers who neglect the warning label for chlorpyrifos since penalties for violation were not included in the announcement. “FDA was waiting for the final report by police and provincial public health investigators on the cause of death of five guests at the Downtown Inn in a northern province of Chiang Mai before taking any further action on products containing chlorpyrifos, he said. “Apart from chlorpyrifos, other products listed in harmful substances category 3 are dishwashing liquid, floor and sanitary ware cleaning products, disinfectant for households, correction fluid and others. “The manager of the Downtown Inn hotel in Chiang Mai earlier denied the hotel had been using chemicals containing chlorpyrifos in guest rooms. 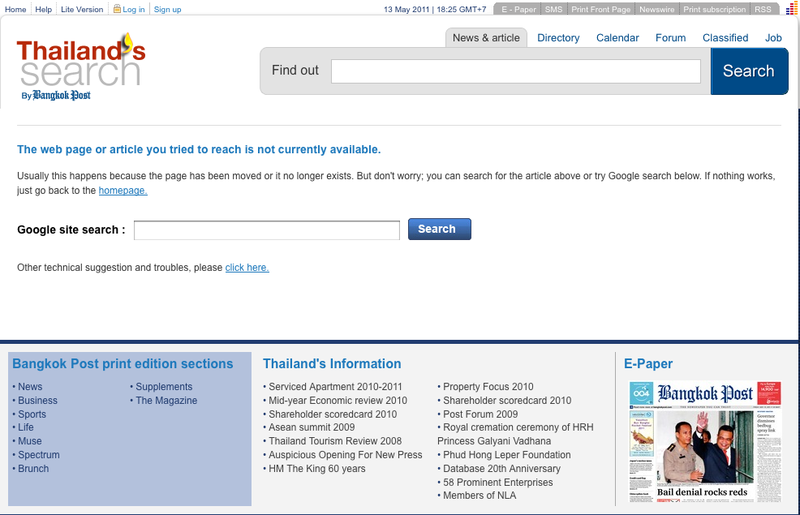 All that remained in standard Google search for the Bangkok Post story two hours after publishing. 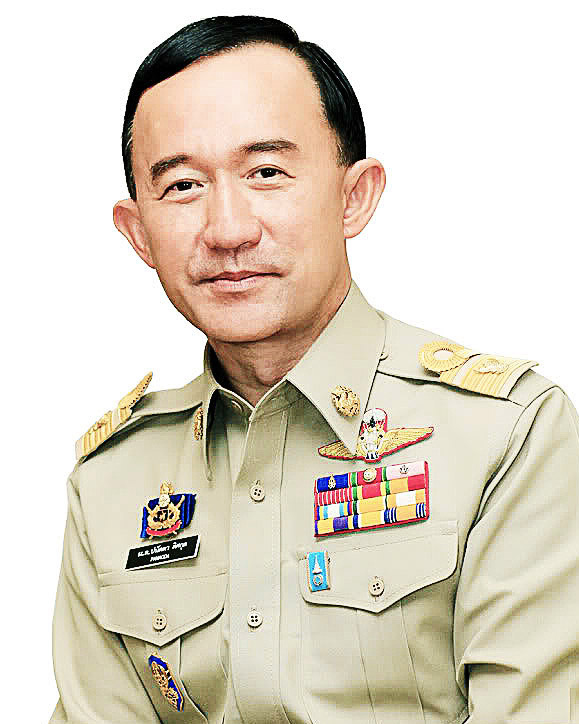 “Chiang Mai governor ML Panadda Disakul also insisted there was no medical evidence to confirm claims of a pesticide containing chlorpyrifos, reported by the New Zealand media as being responsible for the deaths of the hotel guests. “The symptoms of chlorpyrifos poisoning include nausea, fatigue, muscle contraction and chest pain. In critical cases, the symptoms can be as serious as losing consciousness and stopping breathing. “However Mr Wattana, a pharmacist, said there had been reports of fatalities involving chlorpyrifos-mixed chemicals. 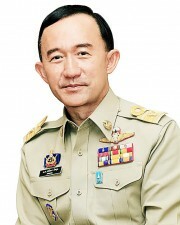 “The first guest who died at the Downtown Inn was Waraporn Yingmahasaranont, 48, a tour guide. “On Feb 7, Sarah Carter, 23-year old student from New Zealand who stayed at the hotel, died of what was initially thought to be food poisoning at Chiang Mai Hospital. “Her friends, Amanda Eliason, 24, and Emma Langlands, 23, also became ill. The two were hospitalised in Chiang Mai and recovered. “On Feb 19, an elderly British couple, George and Eileen Everitt aged 78 and 74, both died in their room at the same hotel. The sudden disappearance of the article from the newspaper’s website led to questions on the Twitter micro-blogging platform, with several Twiterers calling for an explanation. An email sent to Bangkok Post managing editor, Chiratas Nivatpumin, asking why the story had been pulled from its website remained unanswered as of the time of writing, though after reading the article one could be excused for thinking that its contents may have been deemed too much at odds with what is being said by officials in Chiang Mai. Irrespective of the reason, this odd instance of self-censoring by the largest circulating national English-language newspaper in Thailand is only likely to raise more questions than answers about extermination practices used in Thailand hotels, what is really going on with the investigation of the tourist deaths in Chang Mai, and whether the same chemical could be behind the deaths of a number of tourists on Koh Phi Phi. 16 Responses to "Chiang Mai tourist death hotel mystery remains ‚Äì governor slams foreign media report"
this topic? I’d be very grateful if you could elaborate a little bit more. Bless you! A 63 year old Australian friend of mine was found dead in a Chiang Mai hotel on Mothers Day. Hours before he was in good spirits and had talked to friends in Australia. An autopsy is being conducted to diagnose the cause of death. It is not surprising they found traces of Chlorpyrifos in the room. The stuff is the most widely used insecticide in the world. Chlorpyrifos may have been the culprit–I’ve said all along insecticides were at top of suspicion list–BUT…Nope, can’t be from the sheets, the air or the walls. It takes 4 ounces (at least) on the skin of an adult to kill so the sheets would have had to have been soaked in the stuff. Soaked. And they would have had to have gotten the entire 4 ounces squeezed out of the sheets and onto just one body. Sorry, this ‘sheet theory’ doesn’t wash.
Plus there are very few–if any–cases of sudden deaths in the scientific literature resulting from dermal (skin) exposure. So you can see that the dose needed to kill by dermal (skin) is 2,000 mg per kg body weight, which is equal to 2 grams per kg body weight. Chiang Mai victims weighed, let’s say, around 60 kg each, so to die from skin exposure they would have needed to have had 120 grams poured on them–about four ounces. But to die from oral exposure one only need 135 mg per kg or about 7 grams total to kill 50% of a any 60kg group exposed. A teaspoon of the stuff will weigh close to 7 grams so I would indeed like to see the fatuous governor or Chiang Mai, the idiot who has already said the 7 Chiang Mai deaths (see link below) are coincidences and who now says he will eat a “spoon” of it–I’d very much like to see him eat a teaspoon of chlorpyrifos while the cameras are rolling so we can determine if he is in the 50% that will live but get extremely sick, or in the group of 50% that will die. And if he uses a TABLEspoon instead of a teaspoon? His contortions and writhing and foaming at the mouth and respiratory arrest will make fantastic viewing on websites. 200mg/sq meter in a 5x5x3 hotel room would mean a 15 gram cloud of the stuff would have to be hanging around the room for four hours. So very doubtful the just suddenly dropped dead from breathing the stuff. So you can see that out of the 319 exposures reported in 11 years in this one study, there were 3 deaths from the stuff even though most of the reported exposures were by inhalation and dermal exposure. (and the three deaths may have been from ingestion–study doesn’t say). There aren’t too many cases (or any) of sudden deaths from inhalation just as there aren’t many sudden deaths from dermal exposure because you need so much of the stuff to die by these routes. Many people made really sick by skin exposure and breathing? Sure. But not sudden deaths by skin or breathing it. To reliably and quickly die from the stuff you have to eat only about a teaspoon of it. Not hard to slip a teaspoon of the stuff into an exotic drink or dish at a crowded market. Plus, chlorpyrifos is sprayed all over the world in vast quantities and you never hear about people healthy one minute and dead the next who lay on some sheets or breathed some of it. Plus, the Chiang Mai victims were staying in three or four different hotels, making it even more unlikely for skin exposure or breathing exposure. The poison doesn’t have to be chlorpyrifos, which apparently does have a smell—but, then again, if a little tiny teaspoon of it were put in a giant tropical drink or a spicy, garlic, onion dish—would you notice? At any rate, there are hundreds of pesticides many of them odorless and colorless. But drink a tiny amount of the stuff and you’re a ‘gonner’ quickly. Let’s all quit pretending that Thailand is the only country in the world without serial killers. Just because you don’t hear about them in the Thai media only means the Thais don’t do thorough investigations and, if they were to actually find one who was killing tourists, would be very likely to cover it up. To rule out a serial killer without a full investigation is a mistake no Western detective would make–unless the evidence was overwhelming. Great old-fashioned reporting, John. ‘The Bangkok Post’ should be thoroughly ashamed of itself. The governor is obviously an onoxious idiot. He continues to state that the deaths are all coincidence. This plainly obsurd. I do think there could be an alternative explanation. Others have died with similar symptoms who did not stay at the hotel, such as Soraya Pandola. Could the cause not be the spray for the bed bugs, but bed bugs? I specifically mean bed bugs infected with the superbug that can carry MRSA, VRA or PVL. These are antibiotic resistant strains that can lead to chronic fatigue syndrome, chronic kidney failure and heart inflamation and lung failure. Are these similar to the symptoms reported for those that have died in Thailand? We know there were bedbugs in the Downtown Inn since trip advisor reported it. I don’t know about the lodging for Soraya Pandola. The bacteria enters the body through straches (bed bug bites) and can kill within 3 days through heart and respiratory failure. I hope you find the truth and Thailand and its corrupt officials are shamed by their response to these tragedies. Thank you for the time taken to post your observations and provide the links you did. Though not an expert, I think that given the extremely short period of time in which these people died after first becoming ill it is unlikely that a superbug was responsible in these instances. Likewise I find it equally incredulous that an ER anywhere in the world would test a tourist for pesticide poisoning as claimed by doctors in Chiang Mai, and beyond belief that anyone could believe two people, albeit aged people, could both die of myocarditis at almost the same time as in the deaths of Lincolnshire couple George and Eileen Everitt. Thank you for reading and taking the time to share your information. What results? A chemical taken from a room 3 months later? Maybe it was sprayed 2 days before. How is this conclusive in any way? Likely, but this case is not solved until toxicology tests come back and to center it on the hotel rooms specifically at this time- is a mistake. And why is it overwhelmingly women getting sick? Conclusive? In my opinion it is far from that, but a subject for people much more qualified than me to judge. Indicative of requiring further action and investigation? Absolutely. One must also question the honesty, integrity and intent of the owners and management of the hotel in performing a massive cleaning the day before the hotel was to be inspected by health officials, don’t you think? As for the gender imbalance, that is an extremely good question, and one I’m afraid I don’t have an answer for. But I will see if there is any research. As a Kiwi who has regularly visited Thailand for 22 years, I have no difficulty in identifying this as a cover-up by authorities of the first order. 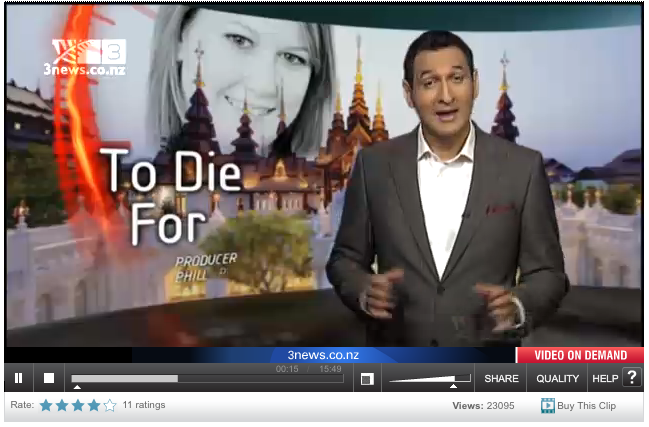 This sad, sad matter keeps attracting media attention around the world, on telkevision and in major newspapers in NZ, Australia, the UK, Europe (all major tourist markets for Thailand) the US, and even Thailand. 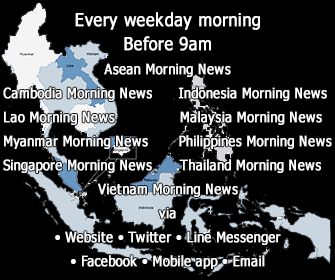 For Chiang Mai and Thailand it is becoming a huge public relations disaster. It is time for a moral stand. The Governor seems incapable of anything other than utter platitudes. He should be called to account by the government and sacked. And, in the absence of court action, the hotel should be blackballed by every tourist operator and website booking company. Originally I formed the opinion that the doctors involved in the postmortem examinations were not covering up the situation, a fact born out by Dr. Mc Dowall who said chlorpyrifos has a half-life in people of about one day. Chiang Mai does have some extremely good doctors and no doctor likes to admit that they don’t know. The actions of the Chiang Mai authorities in light of the finding by the New Zealand 60 Minutes team go well beyond this though and at best is an extreme case of denial, and at worst a poor attempt at covering up the facts. It’s ridiculous to hear the Chiang Maii governor talk of waiting for test results from Japan and the USA, knowing full well that if chlorpyrifos is responsible the tests will be unable to detect it. The actions of the Bangkok Post are a different matter. I know of no reason why a publication would pull an important, public information and safety story in the manner that it did and can only speculate as to what the motives for doing so might have been. Plese note in above long post that it only takes one TEASPOON of chlorpyrifos taken orally to kill but it takes a ridiculous and unrealistic amount poured on the skin or inhaled to cause death. death definitely NOT by skin or breathing exposure. “Chlorpyrifos is the world’s leading insecticide in volume terms(2). The acute oral LD50 (the Lethal Dose required to kill half of a population of laboratory test animals) for chlorpyrifos is between 135-165 mg/kg for rats(7). The dermal LD50 for chlorpyrifos in male and female rats is greater than 2,000 mg/kg. It is classified by the World Health Organisation as a Class II, ‘moderately hazardous’ pesticide(8).” So you can see that the dose needed to kill by dermal (skin) is 2,000 mg per kg body weight, which is equal to 2 grams per kg body weight. Chiang Mai victims weighed, let’s say, around 60 kg each, so to die from skin exposure they would have needed to have had 120 grams poured on them–about four ounces. But to die from oral exposure one only need 135 mg per kg or about 7 grams total to kill 50% of a any 60kg group exposed. A teaspoon of the stuff will weigh close to 7 grams so I would indeed like to see the fatuous governor or Chiang Mai, the idiot who has already said these deaths are coincidences and who now says he will eat a “spoon” of it–I’d very much like to see him eat a teaspoon of chlorpyrifos while the cameras are rolling so we can determine if he is in the 50% that will live but get extremely sick, or in the group of 50% that will die. And if he uses a TABLEspoon instead of a teaspoon? His contortions and writhing and foaming at the mouth and respiratory arrest will make fantastic viewing on websites. “The 4-hour inhalation LC50 (lethal concentration) for chlorpyrifos in rats is greater than 200 mg/m3. Three hundred and nineteen human exposure incidents were reported by the Pesticide Incident Monitoring System (PIMS) from 1970 through 1981, most resulting from inhalation and dermal exposure. Three human deaths were caused by chlorpyrifos” Chlorpyrifos So you can see that out of the 319 exposures reported in 11 years, there were 3 deaths from the stuff even though most of the reported exposures were by inhalation and dermal exposure. There probably aren’t too many cases of deaths from inhalation just as there aren’t many deaths from dermal exposure because you need so much of the stuff to die by these routes. People made really sick by skin exposure and breathing? Sure. But not sudden deaths by skin or breathing it. To reliably and quickly die from the stuff you have to eat about a teaspoon of it. Not hard to slip a teaspoon of the stuff into an exotic drink or dish at a crowded market. So what about the the three other Chiang Mai victims who didn’t stay in Downtown Inn rooms? And if these insecticides are sprayed so liberally by hotel owners throughout Thailand, as I believe they are, then why haven’t there been many more deaths and severe illnesses reported by tourists throughout Thailand? (I think if you sample every hotel room in Thailand you will find residues of chlorpyrifos in many or most of them). Watching Thais spray insecticides just outside my house in Kampangpet–they were defoliating their yards because it was easier than mowing it–I know how easy it is to be exposed to insecticides by inhalation or skin exposure and not even be aware of it because some insecticides are odorless and colorless. (Two smoke detectors of mine went off on both these separate occasions and both detectors were ruined after that–the alarm would never turn off–I theorize because the oily, petrochemical base of the insecticides had coated the detector mechanism). I’ve always maintained in forum posts that Thailand is an extremely toxic place for many reasons, insecticides being at the top of the list. But for everyone to jump to the conclusion that the victims’ exposure had to be by inhalation or skin is still, to me, premature. Wow he’s got a lot of medals, did he get those for covering his own arse? Touch√©!! That’s a wrap, Marc.